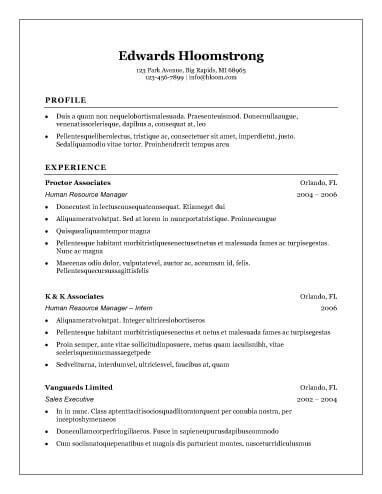 Using a resume template means you don’t have to reinvent the wheel. It isn’t cheating! With a template, all the information you fill in is your own. It simply gives you a leg up by providing the format to present an attention-grabbing narrative that increases your appeal to recruiters and hiring managers. It also ensures that you include all the important details; you’re less likely to leave out critical information when you use a template. Just passed your bar exam? Congratulations! According to the Bureau of Labor Statistics, you’re entering a field with an excellent outlook. That likely means job security, but first, you need to land your inaugural position. We include several entry-level options in our attorney resume templates. Consider one of these to help recruiters see your transferable skills that will add to your talents as a new lawyer. Relevance: Only list skills relevant to the position. Include "soft" skills that point to some of the desirable characteristics. For example, it’s important that an attorney be organized. Order: Use reverse chronological order, with your most recent degree listed first. If you’re currently in a degree program, use the words "in progress" or give your expected graduation date. 1. First, select your design. We have 20 to choose from. 2. Fill in your responses to questions we’ll ask. 3. We’ll provide you with a template that works best with the information you’ve provided.